I need to make an admission – I have a bit of a helmet obsession. Even before getting into Star Wars helmets, I collected old World War Two and post-war military lids. I’m not sure I can explain it, but helmets are just definitive to a person’s look, whether they’re a soldier or a character in our favorite fictional universe. After being extremely impressed with the Hasbro Black Series Stormtrooper helmet, I’ve been on the hunt for Star Wars buckets that are far nicer than their prices allow. 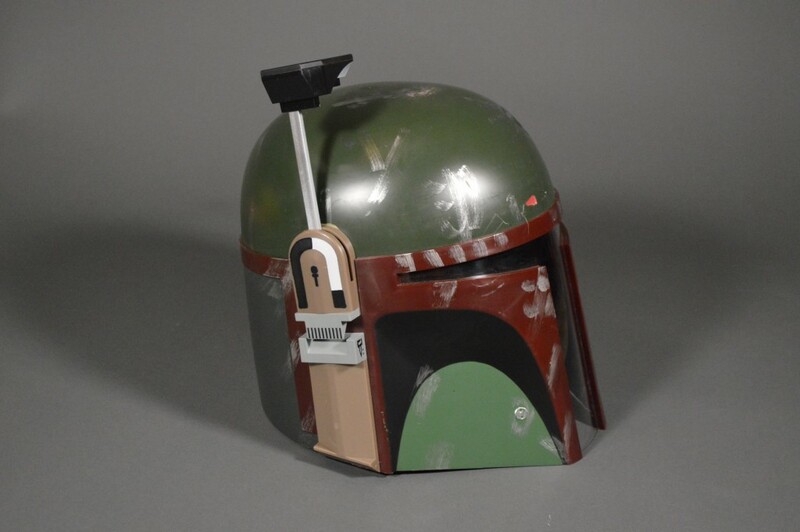 I recently grabbed an Amazon exclusive Black Series Shadow Trooper helmet to join the Stormtrooper lid, but I was still missing another iconic helmet from the Star Wars universe – Boba Fett’s Mandalorian battle helmet. 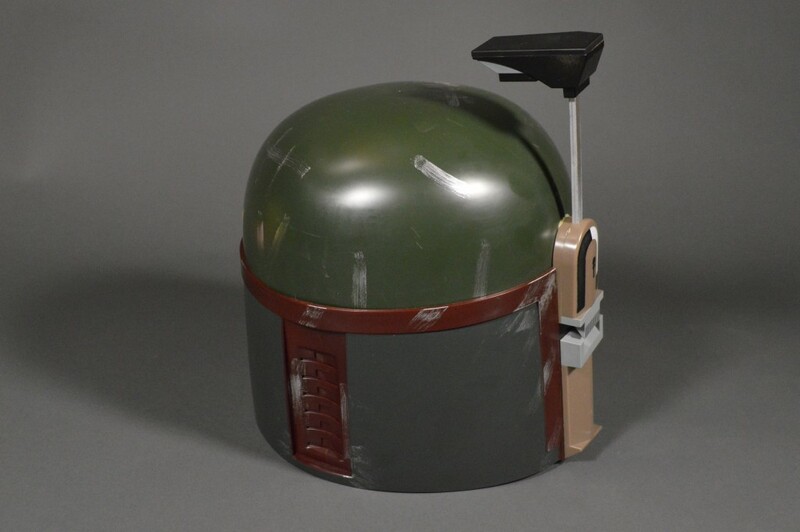 After reading some feedback from other collectors, I turned my attention to the Deluxe Boba Fett offering from Rubies. In general, Rubies products aren’t very well regarded. They’re far cheaper than other costume pieces, like those from Anovos, and it shows. 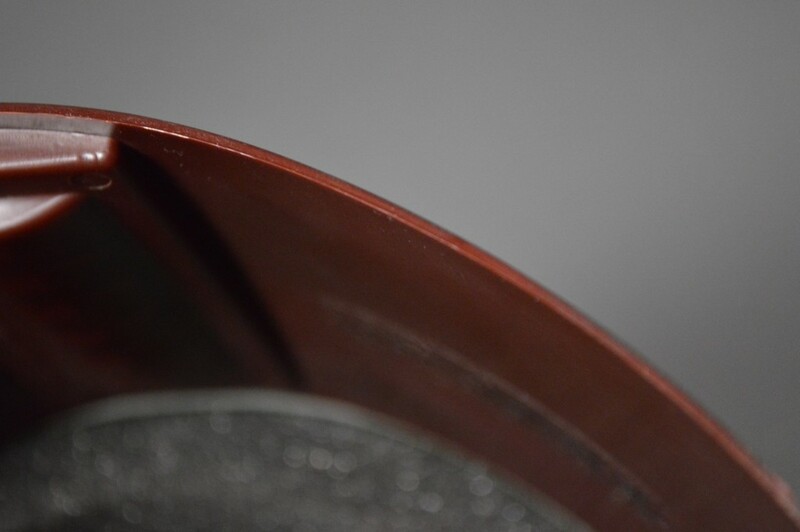 Particularly as helmets go, the Rubies lids are frequently undersized, flimsy, and lacking important details. The Boba Fett is arguably a strong exception to this trend. For it’s sub-$50 price, I was willing to give the helmet a chance. I purchased it via Amazon Prime and had my first Mando bucket just two days later. 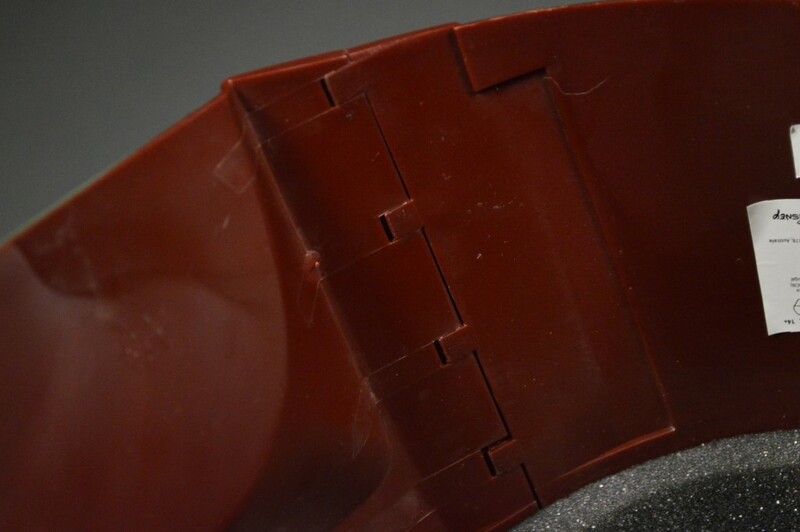 The first thing I noticed when I opened the piece is that it is far lighter than the Black Series helmets. 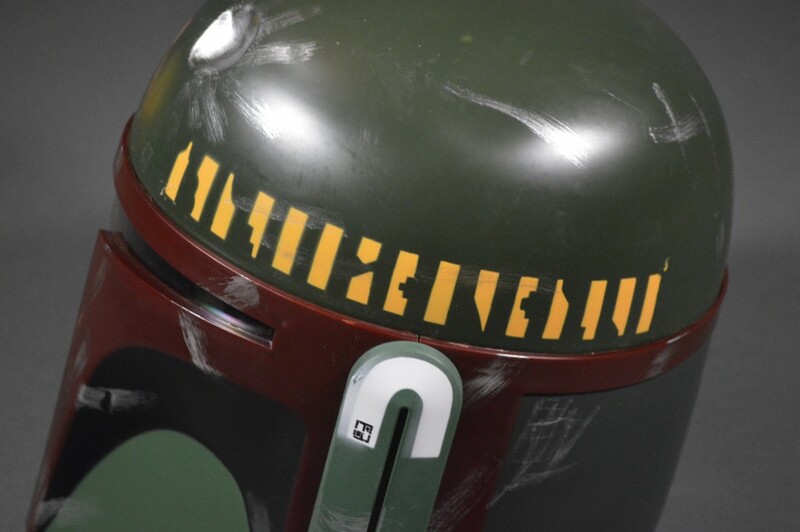 While the Stormtrooper helmets feel as nice as high-end prop replicas, the Rubies Boba Fett is clearly a level or two below that in terms of materials and construction. The plastic is relatively thin and the helmet is quite light overall. Picking it up, you can feel the side walls of the piece flexing and I really doubt that it could handle much abuse. In that case, it is probably well suited to sit on a shelf in my theater. Now, as bad as that sounds, the helmet isn’t a total failure. Beefing it up isn’t all that difficult. I plan to add some fiberglass to the inside to add rigidity and weight. Such an upgrade shouldn’t take much time and I feel like a layer or two of fiberglass around the inside circumference of the helmet will go a long way to make it feel more like a true prop. For the price tag, you really can’t expect this thing to trade blows with $150+ fan-made options. The helmet might be flimsy, but it is fairly well designed. 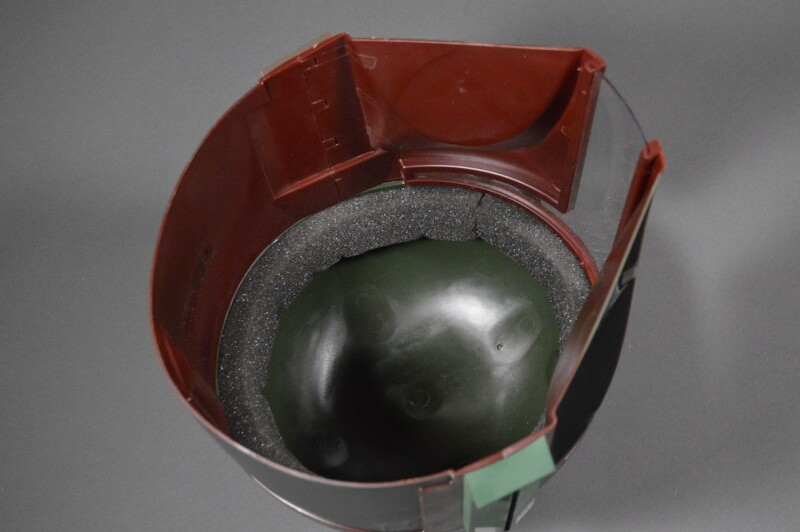 While not a one-piece casting, the bucket is assembled in multiple, logically oriented pieces. The front and back of the helmet make up the two primary sections and the top looks to be molded with the rear of the bucket. 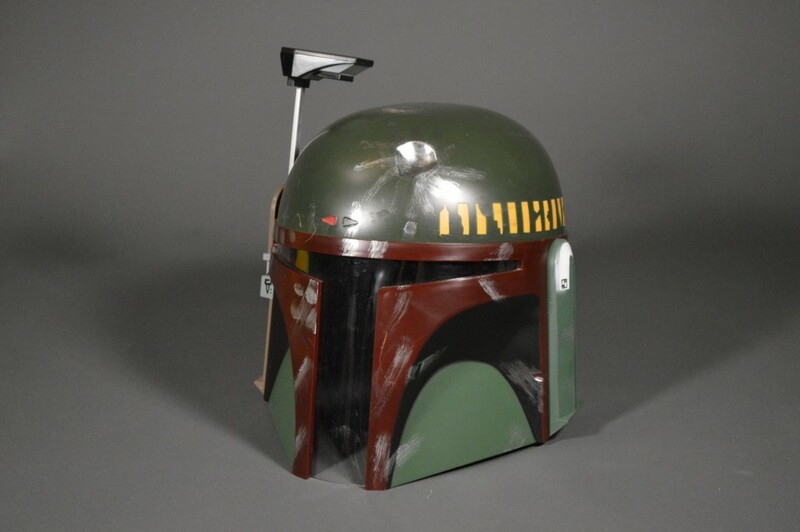 This is different than Rubies’ Jango Fett helmet, where the dome splits across the middle. The seams between the front and back of the helmet are hidden by the “ear” pieces on each side of the lid. The bucket looks like a one piece affair on the outside, but the seams are visible on the inside. This aspect is well done. Another weakness is the helmet’s abysmal paint job. 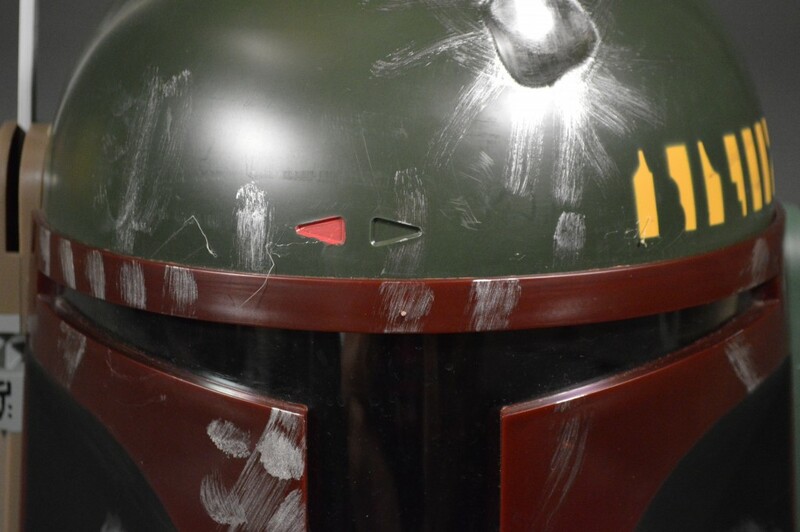 The “weathering” on the lid looks like a lazy dry brush effort that in no way resembles the wear on the real Boba Fett helmet. Sure, the silver marks are in the right general locations, but they lack realism. 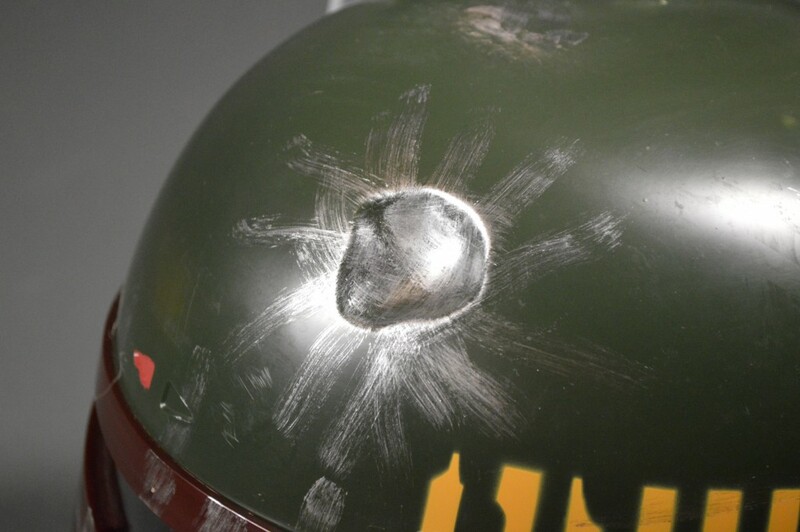 Boba’s helmet in both The Empire Strikes Back and Return of the Jedi looks downright beaten, but the battle scars just aren’t convincingly replicated by Rubies. The famous “cat scratch” isn’t much on this example. Note the extra strings from the glue holding the helmet together. The dent could also use a whole lot of paint work. Again, this isn’t necessarily something to fear. A proper paint scheme takes time and effort to look correct and I don’t think it’s reasonable to expect such detail on a budget helmet. 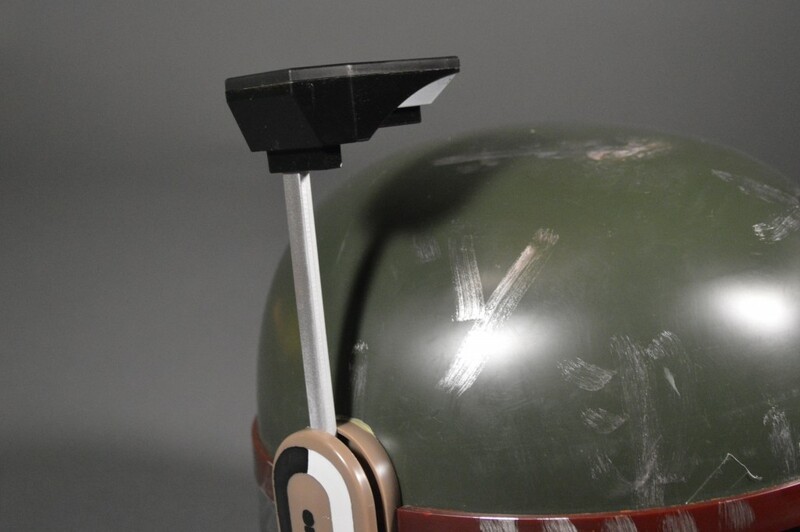 Fortunately, there are some really excellent templates and guides on sites like TheDentedHelmet.com to help with custom paint jobs. I’ve downloaded one such guide for an ESB replica that was put together by user Jigglenomicon. It’ll definitely take time to do the paint, but the end result should be far nicer than anything you’ll find in a store. This is the template I plan to use to give this helmet a better look. For some reason, Rubies opted for a clear visor on this helmet. I understand the desire for greater visibility, but a tinted visor wouldn’t have to be totally opaque to be effective. 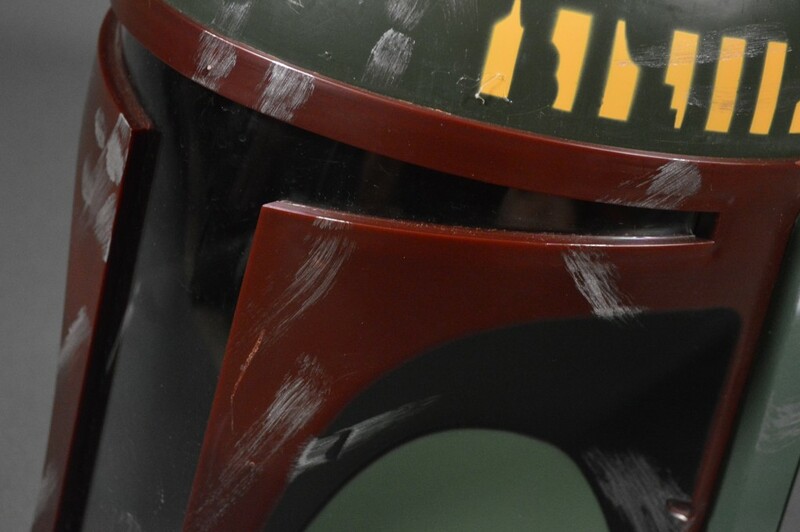 Moreover, as Star Wars helmets go, Boba’s offers some of the best overall visibility. It’s far better than a Stormtrooper helmet. It would have been so simple to get this detail correct. I’ll be adding a replacement from T-Visor. A clear visor, but why? There are a few other details that could use some attention. First, the arrows on the brow of my example are off-center. 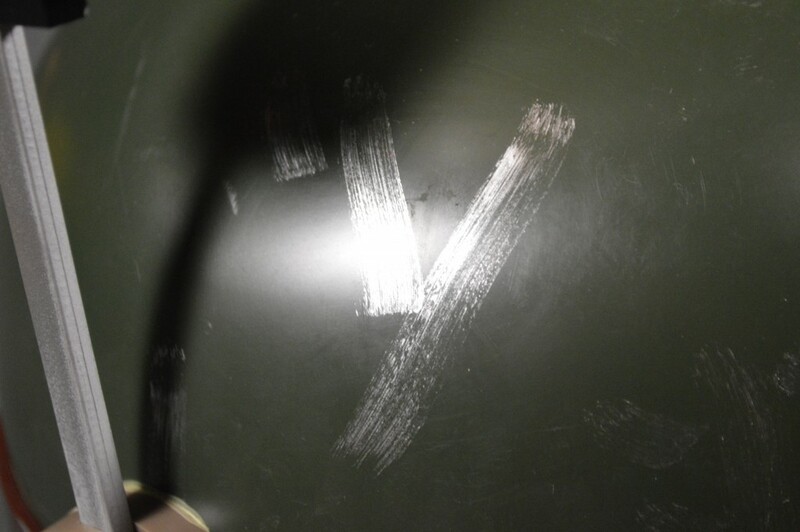 This seems to be a problem that is specific to my helmet and I haven’t seen it on others, so perhaps I am just unlucky. Second, the stalk on the rangefinder is too short. From a practical standpoint and considering that the stalk is made of plastic, this isn’t such a bad thing. However, for screen accuracy, replacement is necessary. Yeah, those arrows aren’t centered at all. The rangefinder stalk is short, but this doesn’t bother me too much. 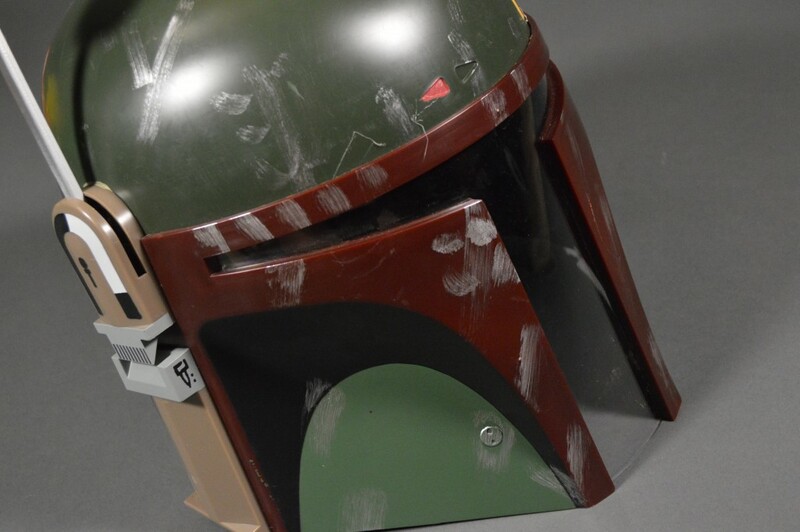 For having just a simple ring of foam inside, the Fett helmet fits surprisingly well and stays in place. I had originally planned to totally redo the interior of the unit; now, I’m not so sure. It just fits my head well enough that I don’t feel like replacement is totally necessary. The minimalist liner actually results in a great fit. If you’ve made it to this point in the review, you may be surprised by what comes off as a whole lot of negativity toward this piece. I actually really like the Deluxe Boba Fett helmet. While Rubies leaves a whole lot to be desired even when they’re at their best, this is actually a really excellent prop for one major reason – size. Everything I’ve mentioned up to this point is easily and cheaply addressed. The one thing that can’t easily be fixed is a bucket that doesn’t capture the proper size or shape of the original prop. Rubies really nailed it here and they deserve recognition for it. The helmet is a true 1:1 replica (or close to it) and sports the proper bell shape that other examples, like the Don Post ones, have failed to copy. The helmet is shaped and sized correctly. When you consider that the shape of the bucket is correct and that it comes in at such a reasonable price, the numerous downsides seem mostly insignificant. 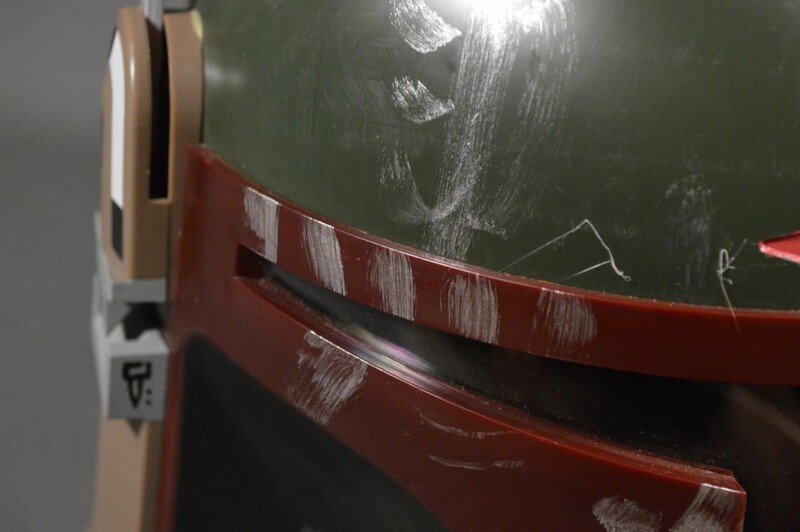 I can fix the paint, swap the visor, and reinforce the piece without investing a whole lot of extra cash. I plan to do those things, too. 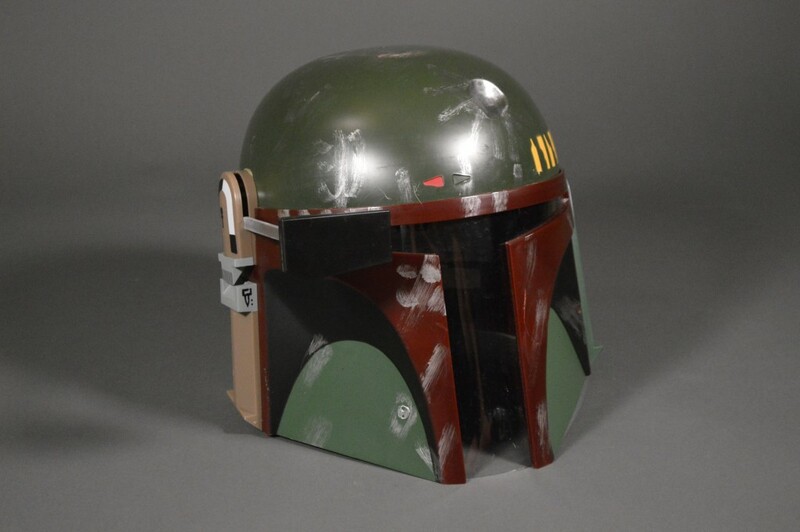 In the end, I’ll have a nice example of Boba Fett’s helmet for far less than pretty much any alternative out there. 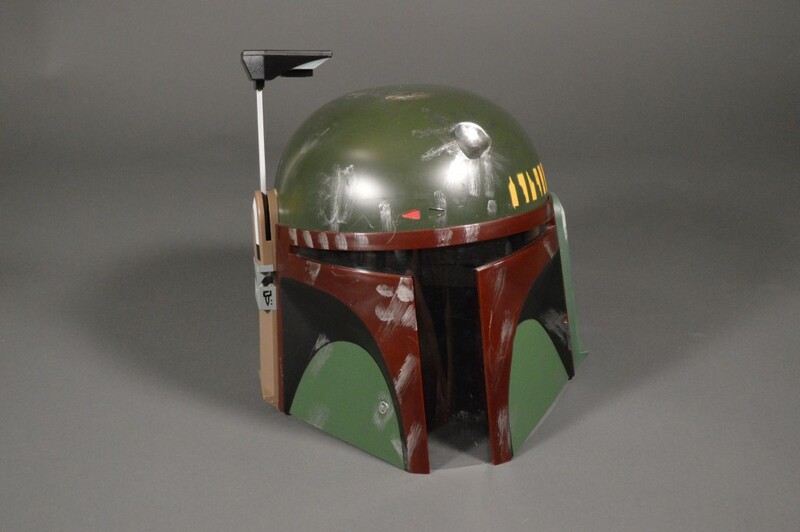 If you have a limited budget and don’t mind a little DIY, the Rubies Deluxe Boba Fett helmet is worth a look.